Code of Conduct | Scan Projects Ltd. 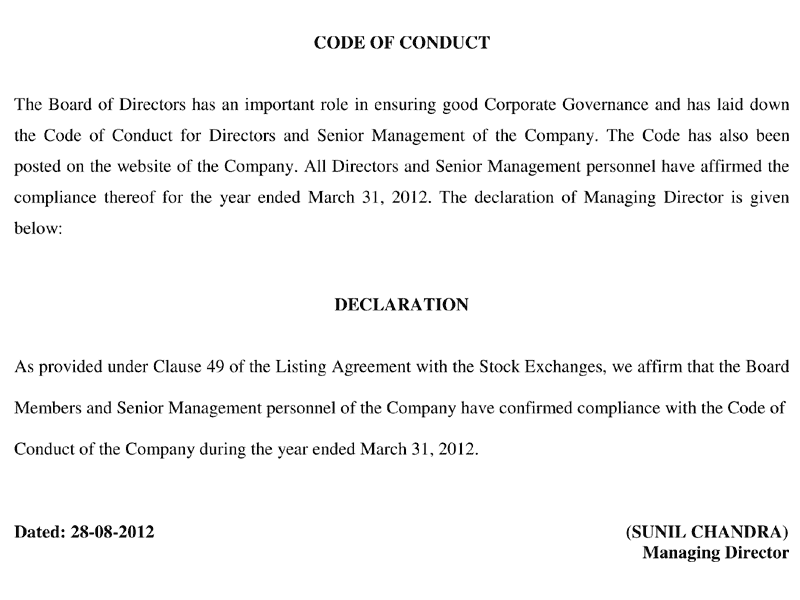 This Code of Conduct (here in after referred to as “the Code”) has been framed and adopted by Scan Projects Limited (hereinafter referred to as “the Company”) in compliance with the provisions of Clause 49 of the Listing Agreements entered into by the Company with the Stock Exchanges. The Code applies to the Members of Board of Directors (hereinafter referred to as “Board Members”) and Members of the Senior Management Team of the Company one level below the Executive Directors and the Company Secretary of the Company (hereinafter referred to as “Senior Managers”). 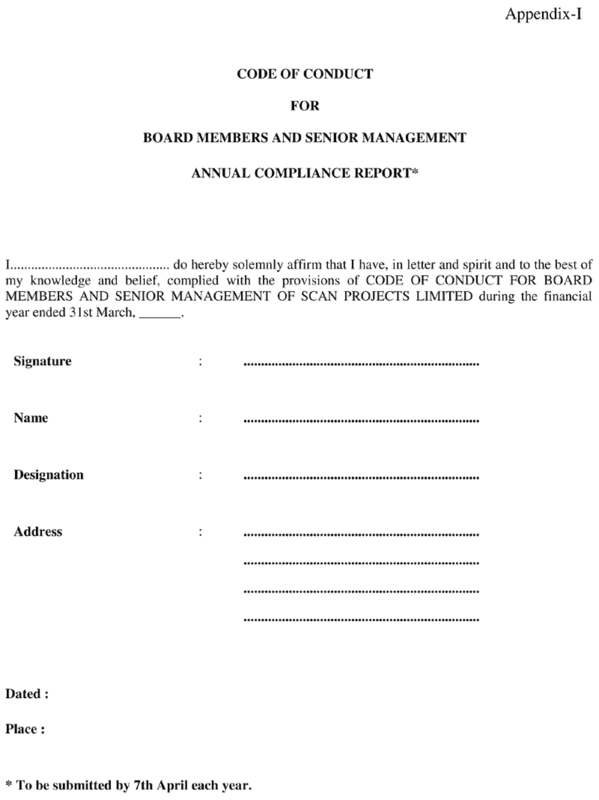 The Company Secretary shall be the Compliance Officer for the purpose of this Code. . The Code shall be posted on the website of the Company. Shall ensure that they use the Company’s assets, properties, information and intellectual rights for official purpose only or as per the terms of their appointment. Shall not seek, accept or receive, directly or indirectly, any gift, payments or favour in whatsoever form from Company’s business associates, which can be perceived as being given to gain favour or dealing with the Company and shall ensure that the Company’s interests are never compromised. Shall not communicate with any member of press or publicity media or any other outside agency on matters concerning the Company, except through the designated spokespersons or authorized otherwise. Shall not, without the prior approval of the Board or Senior Management, as the case may be, accepts employment or a position of responsibility with any other commercial organization for remuneration or otherwise that are prejudicial to the interests of the Company and shall not allow personal interest to conflict with the interest of the Company. Board Member and Senior Managers shall affirm compliance with this Code on an annual basis as at the end of the each financial year of the Company (as per Appendix – I within 7 days of the close of every financial year). 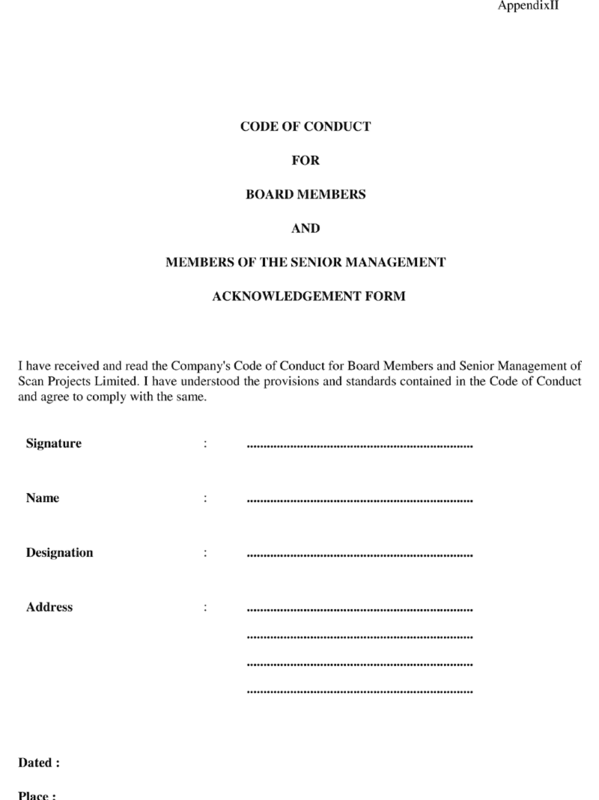 Each Board Members and Senior Managers both present and future shall acknowledge receipt of the Code or any modification(s) thereto, in the acknowledgement form annexed to this Code as Appendix – II and forward the same to the Compliance Officer.